I’ve given you guys samples of my bicep building methods here and there but I think it’s time I give you the whole cake and stop teasing you with those oh so delicious moist, dark chocolate slices. That was one hell of a visual huh? I know. Alright, this program I’m about to unveil is to be done over an 8 week span and has helped me personally add a third of an inch to both of my arms. Granted I am what you’d call an “advanced” lifter being that I have been training for about 10 years now so the results of this will most definitely be amplified for any of you intermediate or beginner gym rats out there. The “A” portion of this program will be the inaugural workout you’ll start things off with and the “B” side of the program will be the 2nd workout that I’ll be issuing, both to be done once a week for four weeks. For example, you can utilize workout “A” with tri’s and forearms on Monday then hit workout “B” with back on Wednesday. There will be a “C” and “D” side as well but these are implemented after four weeks to finish the program off with. You read that right by the way, you’ll be training bi’s twice a week for these sick nasty gains. 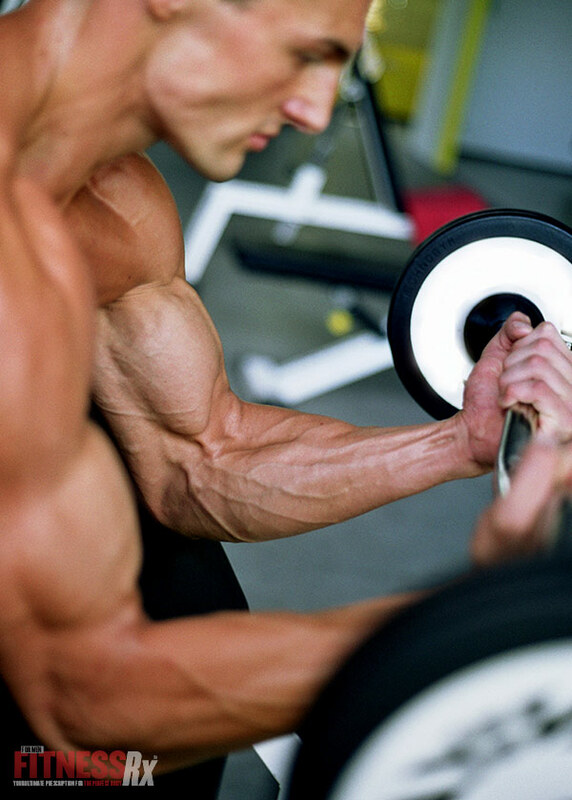 The volume will be high, the exercises will hurt like hell and those arms WILL grow. Let’s begin, shall we? Amount of weight used: I’m aware that we aren’t all the same when it comes to strength so my suggestion to you is, use an amount of weight that will challenge you but not destroy you. For instance, my max in dumbbell curls is around 70lbs so for this high volume work I used 35lbs for the 1st set and 40lbs for the 2nd set as the reps decreased. From my example, I suppose you can assume that I’m advising you to use half your max for every lift here but if that doesn’t quite challenge you enough, add 5lbs and keep it there. The reps will definitely bring you close to tears so the weight itself isn’t supposed to be the focal point here. 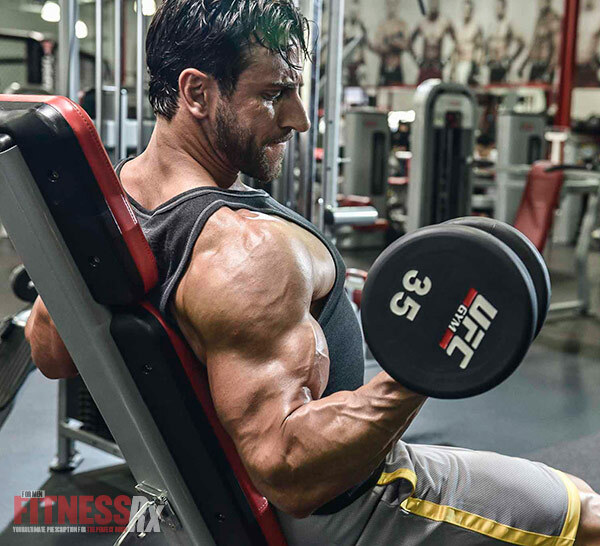 Rest periods: Being that the bicep isn’t a particularly big muscle in terms of workload, unlike the lower body or back, your rest periods will be fairly brief. Research shows that resting for shorter periods of time during weight training is beneficial for optimizing muscle mass. When you undergo shorter rest periods, the anabolic hormones in the body which promotes muscle growth increases thus equaling more muscle being gained. So in the name of science, your maximum resting periods in-between sets will be 50 seconds tops and your minimum will be 35 seconds. There’s no particular diet that comes with this program but it is vital that you’re consuming at least 1g of protein per lb of bodyweight as you submerge yourself in this regimen over the next 8 weeks. Research shows that individuals indulging in 1g to 1.5g of protein per lb of bodyweight will gain muscle successfully when combining that with a weightlifting program, aka my 8 week bicep buster. I myself was consuming about 1.2g of protein per lb of bodyweight throughout all this and saw results but as long as you’re taking in at least 1g of protein per lb of bodyweight you should be good. Also, make sure you’re getting in some type of casein right before bed as that helps with overnight recovery. Whether it is a cup of milk, Chobani yogurt or supplement based Casein, get it in your system before you hit the sheets. As far as supplements, the staple in my stack as I practiced this progression was EPIQ Protein Isolate but supplements are NOT a necessity ladies and gentlemen. Food was, is and will always be number 1 when it comes to nourishment of the body and contributing to gains so if you’d rather not go the supplement route, it’s all good in the hood. I’ve given you the blueprint along with some footnotes, now all you need to do is execute; track your progress and marinate in your triumph when it’s all said and done!